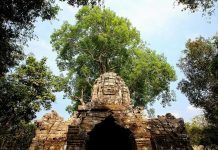 Phnom Bakheng is a temple mountain in honor of the Hindu god Shiva and one of the oldest temples in the Angkor Archaeological Park. 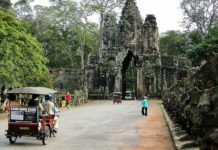 Thanks to its location on a 60-meter high hill, Phnom Bakheng became a very popular tourist spot for its magnificent sunset views over Angkor Wat. 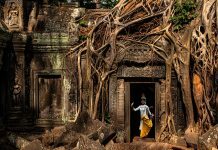 During his reign, King Jasovarman I (889 – 910 CE) moved the capital of his empire from Roluos to the location which is now known as Angkor. 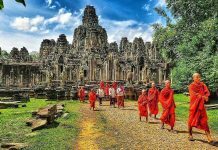 Here, he created an enormous city of 16 square kilometers; bigger than Angkor Thom, which was built later. In the center of this city, King Jasovarman built his State Temple on top of a natural hill, known as Phnom Bakheng hill. Phnom Bakheng is a pyramid shaped temple consisting of 7 levels, symbolizing the sacred Mount Meru and the 7 Hindu heavens. 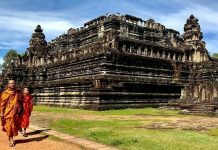 108 towers were arranged on the ground and upper levels of the temple, symbolizing the 4 lunar phases of each 27 days long. Unfortunately, most of these towers collapsed. 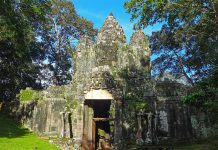 The temple was devoted to the god Shiva and served as a tomb for king Jasovarman I.
Phnom Bakheng is located 400 meter south of Angkor Thom. If you’re approaching from Angkor Wat, then Phnom Bakheng hill is to the left side, set back from the road. It’s worth stopping. A sandy path winds up the hill to the foot of the temple. From here, steep and narrow stairs lead you to the top terrace. The view is breathtaking and if you visit at sunset it’s a soothing way to end the day. Elephant rides (US$ 15) to the foot of the temple are available during sunset as well. However, it’s a good idea to read about elephant tourism and perhaps avoid this particular ‘attraction’. Asian elephants are endangered and are subject to various forms of abuse in order to provide tourist rides. Read more here. 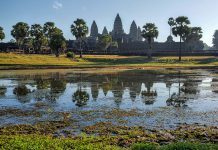 Given that Phnom Bakheng’s main attraction is its sunset view over Angkor Wat, plan your visit for the late afternoon. Arrive early (4pm) if you want a good spot on the south-east corner. Especially in high season the temple can get crowded. 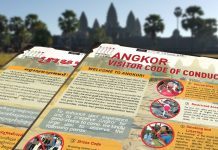 Note that you’ll need a good zoom lens to make a close-up picture of Angkor Wat, which is 1.3km away. Alternatively, there’s a fantastic sunset view over West Baray on the opposite side (north-west corner). 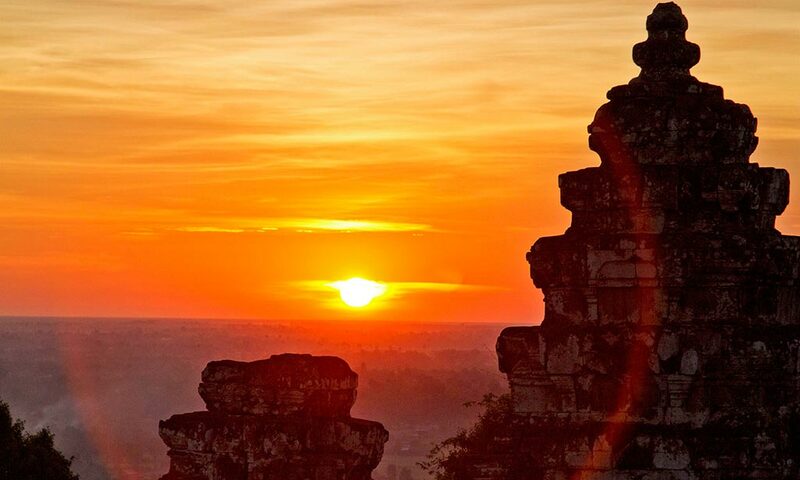 After enjoying the sunset, be careful climbing down Phnom Bakheng temple’s steep steps. A small flashlight will come in handy.